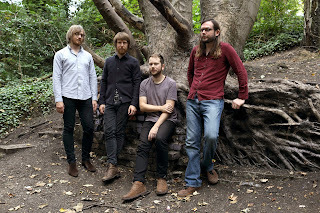 If It's Too Loud...: Wolf People - "Ninth Night"
The lead single from Wolf People's upcoming album, Ruins, might be the creepiest thing we've covered here at If It's Too Loud... On first listen, "Ninth Night" is a heavy blast of psychedelia. It's trippy, but it rocks at a medium pace while being oddly, almost hypnotizing in a weird pop way. The song is almost fun. But... there's something uncomfortable about the song. Turns out the song takes its lyrics from an old incantation from the 1700s that burglars would use to lull victims into a deep sleep. Oh, and they did thins while holding a Hand of Glory, which was the stolen hand of a hanged man dipped in wax. Knowing that gives the lyrics “Let those who rest more deeply sleep / Let those awake their vigils keep / Oh hand of glory shed thy light / Direct us to our spoils tonight" a whole new meaning. Ruins is due out on November 11 via Jagjaguwar. You can pre-order it here, and watch the video for "Ninth Night" below. For more information on Wolf People, check out their website.